Each section of the Destroyer and Submarine on each side one-way assaults the connected torpedo. Each section of the Aircraft carriers one-way assaults the connected jet fighter. 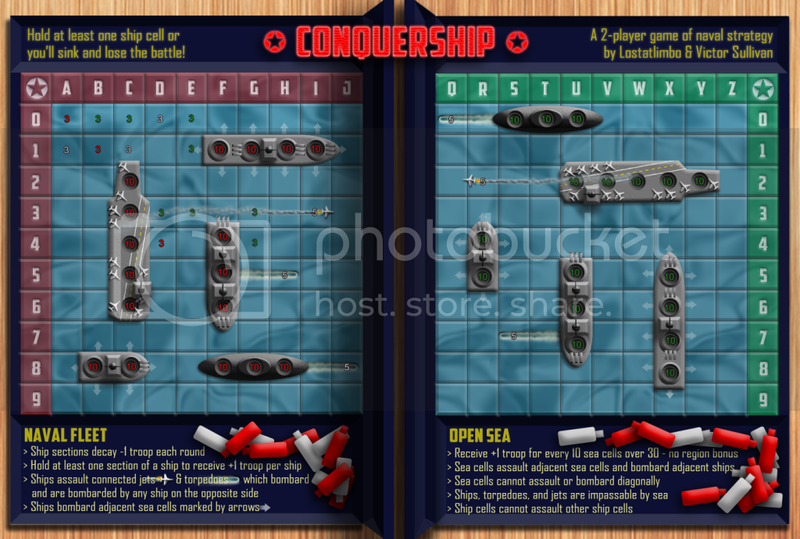 Torpedoes and Jet Fighters bombard and are bombarded by any ship on the opposite side of the map. Each section of the Battleship and Patrol Boat bombard the sea cells marked by arrows. Sea Mines, Torpedoes and Jet Fighters are all impassable by sea. The trails connecting the latter to their ships are normal sea cells. This essentially functions like train connections do on various maps by showing a connection without interfering with the territory. Toyed with the table background and toned it down considerably. I lowered the starting # of troops to 10 and the torpedo/jets to 5 to help minimize first-turn advantage. Victor Sullivan and myself are pleased to present Conquer Club's first map designed exclusively for 1v1: Conquership. Special Features: Receive a bonus for holding ships and sea cells on your side of the map. 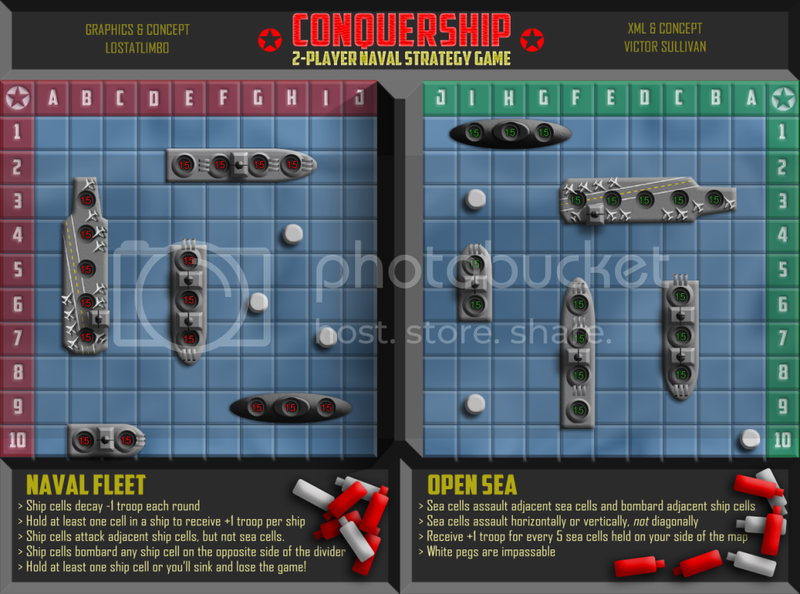 Hold at least one ship or lose the game. What Makes This Map Worthy of Being Made: The first map on CC to be designed exclusively for 1v1 play. Last edited by isaiah40 on Sun Jun 16, 2013 10:14 pm, edited 29 times in total. 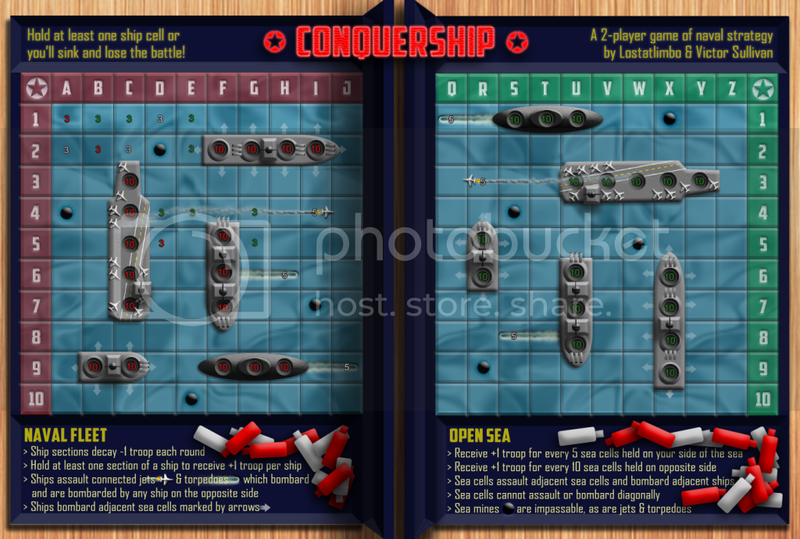 Re: CONQUERSHIP v.1 [29 NOV 2011] You sunk my Conquership! Ah! Finally, lol. We've been working on this for how long? Victor Sullivan wrote: Ah! Finally, lol. We've been working on this for how long? Haha. Yeah, I am a slowpoke. Those continent bonuses were a P.I.T.A. Oh, sorry, I didn't mean it like that. Just thinking about how long ago we started this (and how much longer we're going to be in here and the Workshop, lol). I'm just totally psyched to see a gameplay sketch of mine see the light of day! Sully came up with a workaround to make this happen. I'll let him explain it as his knowledge of the XML is far superior to mine. Sully - if you want to type up a brief summary of the XML details, I will add it to the OP to clear up any confusion. The requirement is set so that you must hold at least one sea or ship cell (basically any other territory than a Headquarters or Red Peg) to stay in the game. The losing condition also does not interfere with 3-8 player games, since no one will be holding anything but sea or ship cells. This sounds pretty cool. I like the idea, and if the XML can work, boons. What Sully said is possible. Just a question, reading your explanation in a 3-8 players game no one will have a HQ and nobody will be able to attack it, right? thenobodies80 wrote: What Sully said is possible. Just a question, reading your explanation in a 3-8 players game no one will have a HQ and nobody will be able to attack it, right? You are correct. The HQ cannot be assaulted, nor will anyone in a 3-8 player game start with one. The Red Pegs can be bombarded by the nukes/bombs, but not assaulted. I would be surprised if the bombs ever come into play in a 3-8 player game. Though, I suppose I could code the Red Pegs as neutral 1's for nice, safe carding spots, but it would cost the 10 neutrals on the bomb. Who's ready for Conquer Club's first 1v1 map? Ok, thanks for your confirmation, in this case we should talk about a thing. thenobodies80 wrote: Ok, thanks for your confirmation, in this case we should talk about a thing. i like the idea but wouldn't it be easier to make 1 map for 1v1 and another for 3-8players? player limitations are possible and have been done in the past so if a map has merit i think it would be done again. Yes about the map. But we can continue with PMs or Live Chat, it's better. I love the idea behind this map and the graphics. Very nice so far, guys! Sully and I went back to the drawing board to make this map exclusive for 1v1 play. 4. 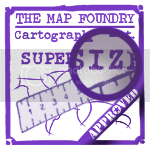 Before posting your map in the drafting room is "highly recommended" to send a PM to Foundry Foreman with a draft of your 1v1 map or, if you don't have a draft, at least a clear explanation of what you want to develop. This is required to make sure that CA's can look at your project before proceeding any further. The CA's will give you a detailed reply as soon as possible. In case of rebuttal they will give you a reason. plus it was much more interesting as it was before with 2 different gameplays. I requested and received permission to post this update. I think this gameplay will be very fun and challenging. It offers many potential strategies - both offensive and defensive - and has plenty of features that only 1v1 could accomodate. but you could perhaps develop the other one too. i really liked the 3-8p perspective it had. That's a possibility. We'll see how this one goes. I'm interested to see what you'll come up with for 1v1. All Your Bases would be a good fit, in my opinion.